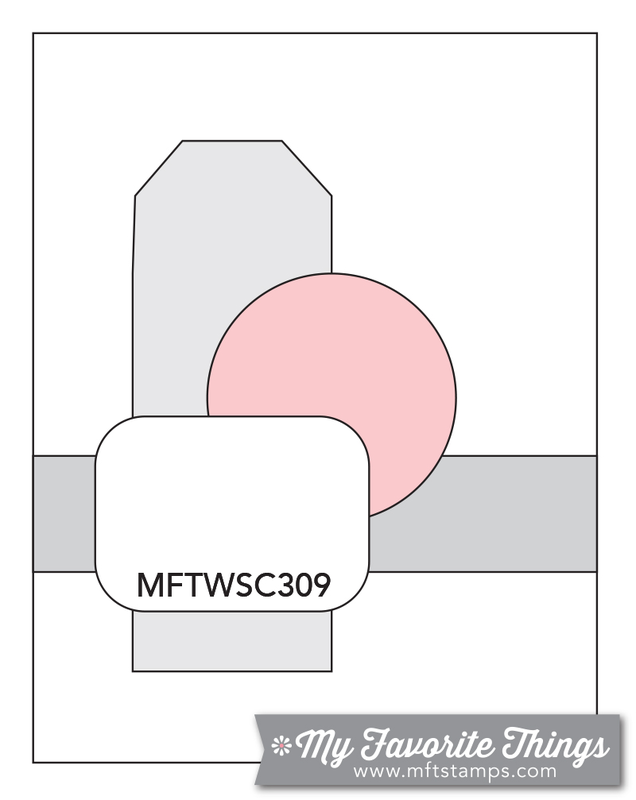 Below you'll find Sketch 309. Create cards, scrapbook layouts, home decor, treat containers, mixed media, etc. using this week's sketch and be sure to link your project below for a chance at the weekly My Favorite Things Gift Voucher worth up to $20. 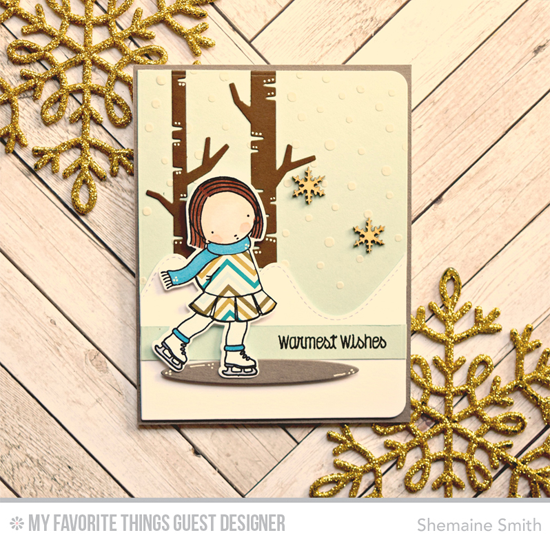 Shemaine paper pieced the sweet Ice Skater in her loose (but cute) interpretation of Sketch 309. The Birch Trees stand in for the vertical portion of the sketch, and the skater layers on top of it to serve as the focal point. I love how she's placed her on one of our Oval Shadows — just perfect to mimic a skating spot. Thanks for joining us this month, Shemaine! The My Favorite Things Creative Team has been busy getting creative! Let's see what they have up their sleeves for Sketch 309! What a festive design Keisha has created with her direct interpretation of Sketch 309. 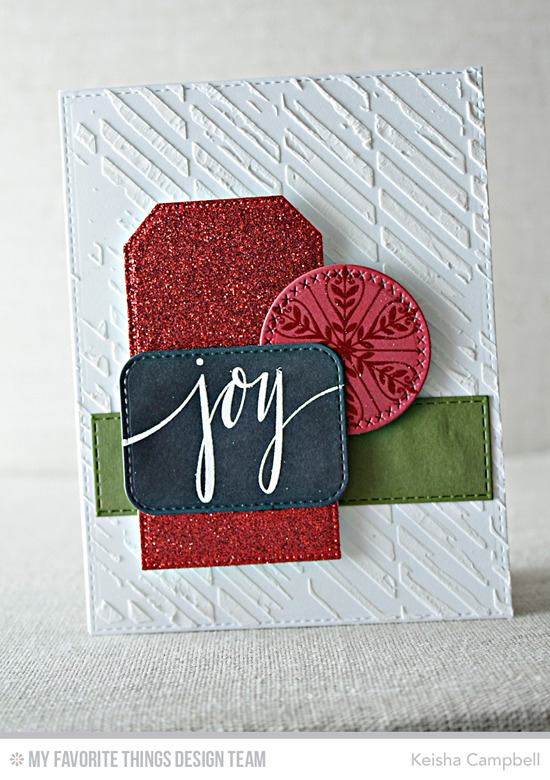 The red sparkle tag anchors her perfectly placed accent circle with the pretty stamped snowflake, and her treatment of the sentiment looks like a trendy chalkboard. Simply delicious! Julie's card is a direct interpretation, too, but it has a completely different look from Keisha's. That's the absolute BEAUTY of sketches — you can go your own way. She features one of the cute Polar Bear Pals on this totally sweet design. Vika uses the circle of the sketch as a sweet spot for the snoozing Playful Pups to rest. I absolutely ADORE how she added little hearts around the perimeter of the circle, and the Lined Up Dots Background stamp makes a super cute pattern to offset her whimsical design. Nary a stamp was used on Barbara's delightful card she created for Sketch 309. She gave her die cut machine a workout with the Merry Christmas, Stylish Snowflakes, Stitched Traditional Tag STAX, and Blueprints 19 Die-namics. She added fun texture with the Snowfall stencil, sequins, and twine. So pretty! 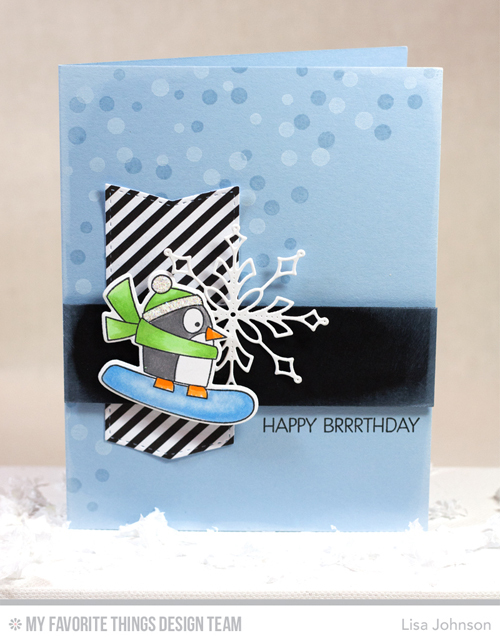 One crazy cool snowboarding penguin from the Chill Wishes stamp set is diving right into our hearts on Lisa's fun design! 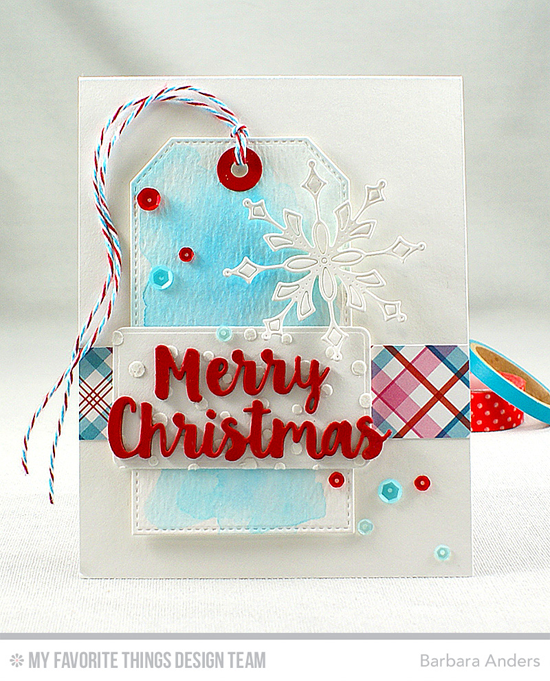 Instead of a circle, she adds a frozen feel with one of the Stylish Snowflakes Die-namics. The striped patterned paper adds a jaunty feel to this chilly design. Congratulations, Squirrel! You are the randomly selected winner of last week’s sketch challenge. You can view all the entries for last week’s challenge HERE. You have until Tuesday, December 6th, at noon EST to add your link and be eligible for the prize of up to $20 in MFT Cash to be spent in the MFT boutique. Winners are chosen at random, so everyone has a chance! The weekly prize is a $15 Gift Voucher to My Favorite Things, but if you use MFT stamps and/or dies in your project, you’ll receive an extra $5.